There are 31 Assisted Living Facilities in the Long Grove area, with 2 in Long Grove and 29 nearby. The average cost of assisted living in Long Grove is $4,647 per month. This is higher than the national median of $3,346. Cheaper nearby regions include Buffalo Grove with an average starting cost of $3,999. To help you with your search, browse the 216 reviews below for assisted living facilities in Long Grove. On average, consumers rate assisted living in Long Grove 5.0 out of 5 stars. Caring.com has helped thousands of families find high-quality senior care. To speak with one of our Family Advisors about assisted living options and costs in Long Grove, call (855) 863-8283. Despite being located just 35 miles from Chicago, the historic village of Long Grove, Illinois, cultivates a relaxed atmosphere and old-fashioned charm that has plenty of appeal for seniors who enjoy a quieter pace. A little over 13 percent of the approximately 8,000 residents are age 65 or older, leading to a thriving senior community. Residents can choose from two assisted living facilities in Long Grove itself, and an additional 29 facilities are located in nearby communities. They are regulated on a state level by the Illinois Department of Public Health. Assisted living facilities are required to provide residents with certain services, including serving three meals a day, providing housecleaning and laundry services, and maintaining 24-hour security and emergency communication response systems for resident safety. Long Grove is often considered to be an expensive place to live. This is mostly due to extremely high real estate costs, which may not impact seniors in assisted living. Residents generally spend slightly less than the national average on groceries, health, and utilities. Winters in Long Grove tend to be cold and harsh. It typically receives around 40 inches of snow a year, which may make it difficult for active seniors to get around. Summers tend to be fairly mild, with typical July highs in the low 80s. Public transportation in Long Grove is limited, which can make it difficult for seniors who don't drive. There is no public bus system, and the nearest Metra train stations are located in the neighboring towns of Buffalo Grove and Arlington Heights. Taxis and ridesharing options are available. Long Grove's thriving Historic Downtown district offers plenty of art and culture despite the town's small size. The town hosts multiple festivals each year, including Vintage Days, Strawberry Fest and Apple Fest. The Long Grove area is home to world-class medical facilities, including Northwest Community Healthcare Hospital in neighboring Arlington Heights, in the event of medical emergencies or illness. Lake County, in which Long Grove is located, was given an "F" rating for air quality by the American Lung Association due to high ozone levels. Seniors with respiratory illnesses may be at risk. Assisted Living costs in Long Grove start around $4,647 per month on average, while the nationwide average cost of assisted living is $4,000 per month, according to the latest figures from Genworth’s Cost of Care Survey. It’s important to note that assisted living rates in Long Grove and the surrounding suburbs can vary widely based on factors such as location, the level of care needed, apartment size and the types of amenities offered at each community. 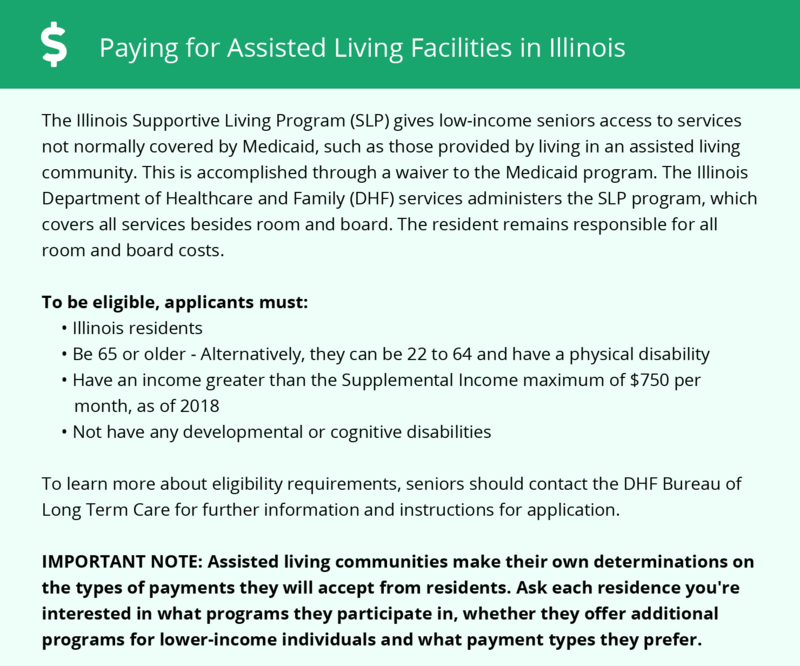 Seniors who are eligible for Medicaid may qualify for the Illinois Supportive Living Program, which pays for daily care tasks that are not usually covered by Medicaid. The state's Community Care Program also provides coverage for similar services. To see a list of free assisted living resources in Long Grove, please visit our Assisted Living in Illinois page. Long Grove-area assisted living communities must adhere to the comprehensive set of state laws and regulations that all assisted living communities in Illinois are required to follow. Visit our Assisted Living in Illinois page for more information about these laws.